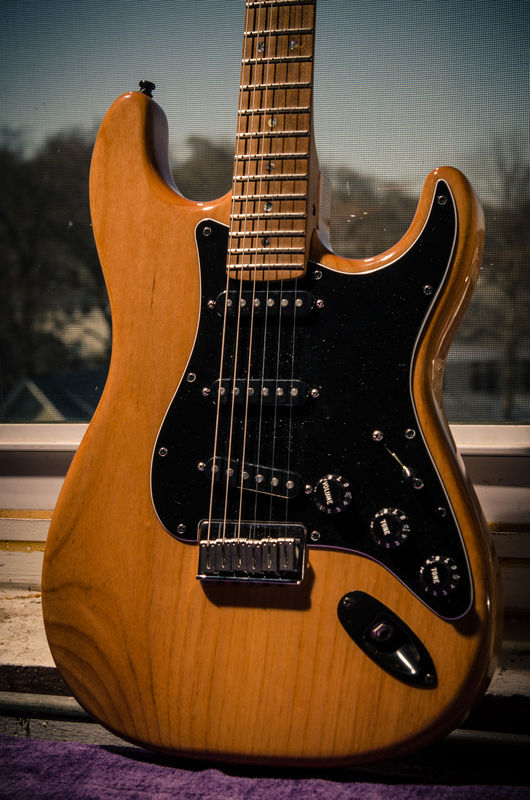 Here's one of two Warmoth Strats a customer brought in for assembly. Check out the unfinished roasted maple neck! This one was partially assembled with the pickguard (wired up with Bill Lawrence L280 / L290 pickups) and locking tuners pre-installed. I mounted the output jack, double checked the wiring and set up the guitar with D'Addario XL 10s. I also had to swap out the saddle set screws for longer ones to account for a high neck angle. The original set screws were only a thread or two away from maxing out. I could have adjusted the neck angle but the shim would have been on the visible end of the neckpocket.